I was devastated when it suffered a catastrophic failure. I looked for ages to find just the right bike. 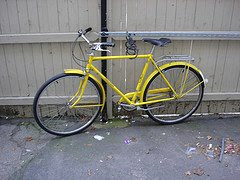 There is a man here in Boston who finds old bikes that people are throwing away and fixes them up to sell on Craigslist. I called him about a bike he'd actually already sold and so we discussed my options. None were very exciting. Then he told me he had a special bike that had been sitting in his basement for three years, waiting for the right buyer. He described it and it was intriguing. I showed up to see it and it turned out to be the right size and "my" color. The sale was a foregone conclusion. I really should get some more photos for you of the lug work, it is stunning. I am still updating and improving it for its new life as an urban cycle. There is my bike and the outline of how I got here. 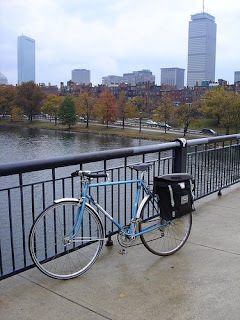 I'm working on encouraging a number of women I know in America to get bikes, and so I've recently started a blog of my own, with yours as one of my inspirations.